Vlog, paper secret about hunt Trophies and the trophies happy on the wall + Upcoming launching of the new workshop. 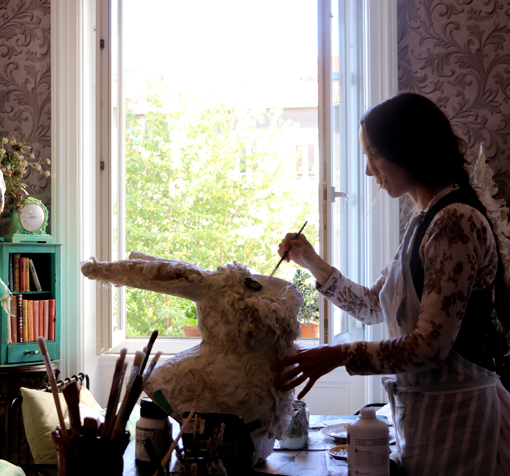 In my Marathon filming the new fairy tale home Decor Workshop, painting the Deer Hunt Trophy. An october Vlog with my latest decor treasures and my witch mirror and a visit of a beautiful cemetery in St Etienne. A new Vlog and teh frog footman from Alice in Wonderland completed. The frog footman is a bit late but he will arrive on Etsy tomorrow night! The Frog Footman is getting dressed ready to receive the invitation from the Queen to play croquet. And you are most Welcome in my Studio tour ! The studio Tour is a bit late ….. The end of my studio makeover and the Favourites video if you missed it . The second big White Rabbit is ready to jump into his rabbit hole, Will you follow him ? The March Hare and the Mad Hatter are ready to inviote you to their tea party . An update on the march hare,who is late, the mad hatter, the sheep from the Sheep shop, we are always exploring Wonderland and Through the Looking Glass! The March hare is getting dressed, the White Rabbit is playing with his watch and a July favourites Video has been posted.